Has anyone replaced the fork springs on 1990 gl 1500 se. There seems to be two springs in each fork and the replacement is the one long spring. Wondering if any problem with the change. One long spring each is current and will work just dandy for you. The older Progressive springs for 1500 were two piece. I don't know exactly when Progressive went to one piece construction. Newer and current Progressive # 11-1152 forksprings for GL1500 are one piece each (2 in set) and will work in any 1500's front end. When I got our 1500 (a trike), it already had Progressive two piece front fork springs. It now has Progressive one piece springs …. I did some swapping a few years ago. You aren't by chance talking about a trike with rake kit are you? If so, you'll likely be happier with the ride using the below info. I posted this elsewhere years ago when I did those spring changes. I also include specs. 20.50 " L <>1.35" OD <> 35/80 Lbs/In. 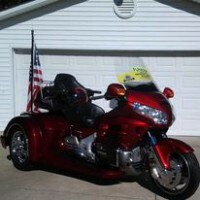 In 2004 I puirchased my already triked 97 GL1500 SE / Lehman trike, I knew this bike since purchased new in Oct '96, it was first '97 delivered in H-burg. Original owner triked it in '97. He was a Lehman installer, they rode it for years as he built others for folks. It already had Progressive # 11-1152 as indicated by the reciepts they kept in a book of all items for it. Complete with records and a trailer! I had it a month before I ordered a Champion EZ Steer in 6 degree flavor, got one of the last before they stopped making the 6 degree one he said. Near $900 shipped, I installed Oct '04, reused the Progressive # 11-1152 springs as all I had on hand. Rough ride and front end sagged. Look at spring rates above, see why? I do. Couple years ago, tired of the beating, being a procrastinator too, I looked around and found a set of springs listed for a 1200 on Ebay, I ordered them, as number sounded familiar to what I was looking for 11-1122. Got them, slipped them in in place, WOW!, it was wonderful. They fit a little loose in the bore, squeaked at first, but oh ... What a Ride they gave! Looking later on box, see they were really Progressive # 11-1112 springs, not the 11-1122 springs I thought I ordered. The squeak went away first ride. Speed forward, I keep eyes open on Ebay, one day picked up a set of the 11-1122 springs for a GL-1200 cheap, new in box. I get them and put on a shelf. March 20th, we take a ride over to the Maple Festival, great trip, fun ride. That evening or the next, while cleaning the trike I decided to slip the recently aquired 11-1122 springs in place and removed the 11-1112 springs. I made up 5/8 spacers and that with the shorter 11-1122 springs held the front up near top of stroke at rest. These are the springs Progressive sells for the GL-1200 and the OD is very nearly the same as stock 1500 springs. Took several rides since, still a comfortable ride, 10X better than those 11-1152 springs originally in it, and front set up ... but memory told me the "wrong" 11-1112 springs rode better, swallowed bumps better, and held the front up as well as the 11-1122 springs with spacers ... even without spacers. 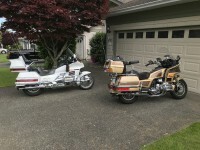 Saturday we had a near 250 mile ride planned, we went. Saturday night as cleaned it up from what was a dusty ride, I decided to slip the "wrong" 11-1112 springs back in. It's really easy now, can do it in 30 minutes. Jack under front of motor and set on wooden blocks. Remove schrader valve and drop 5" long smooth 1/4 bolt in hole to keep it all together when loosened, just loosen top clamp and bring out cap & tube extension as one unit (I have fork tubes mounted so about 3/8" of top extension protrudes above top clamp so that top of original fork tube is inside bottom ... so now the top clamp helps allign the cap & tube extension with fork tube as I stand over with speed wrench and chest board I made up). Remove springs one at a time, I wipe new springs with fork oil and insert, put back together. Sunday, we take another 268 mile trip. Yep. memory was right, these Progressive # 11-1112 for Kawasaki KZ1200/1300 will now remain in my GL1500's 6 degree raked front fork tubes from here on out. I might play with fork oil weights, have a 50/50 mix of 7 and 10 wgt Belray Fork Oil in it now, about 8.5 weight, 350 CC each. 325 CC is enough though though. The 1122s were good, and if not for a mistake I'ld be using them and not know any better ... but for a mistake in reading a number on my part and the shippers (the listing showed 11-1122, the numbers on the box so simular upon reciept that I just didn't notice, and the length looked right!). These 1112s work bumps and bridge joints and ripples and etc ... even better. To be clear, no spacers with 11-1112s The 11-1112s have not sagged, they work in this application. Last edited by CrystalPistol on Sun Sep 09, 2018 4:24 pm, edited 2 times in total. Certainly was my findings, I went ahead and edited with my findings above. Thanks CrystalPistol for that information. That is a lot to absorb in my pea brain. I will study that and decide which way to go. I hate to many options. Just to add … back in the '90s and early '00s, before so many 1800s were triked, a lot of guys were asking for softer riding springs in raked 1500 trikes, and the hot tips all over the boards were saying Progressive 1200 springs with a 1/2 or 3/4" spacer. That was where I placed that order mentioned in my post. The reason for some softer springs with a softer change in rate is because the fork tubes are laid down 6 more degrees, closer to horizontal, so a 1" bump needs more spring compression than oem (think about this, if fork tubes were level, they would not compress at all, very harsh). There are guys on here that will recall them days and posts if they think on it. My first reading of it was on old GWRRA boards. Even in later '90s I started to notice less and less conversations about tips, workarounds, cures, etc pertaining to the GL1200s so I started saving stuff … and glad I did. I also save stuff pertaining to 1500s as they get rarer (as it seems like just yesterday I wanted a new 1500, and that was near 20 years ago now). Anyway, just wanted to be clear … I discovered these better springs through a mistake, and my trip down that road was after reading of other's trips in search of better ride. 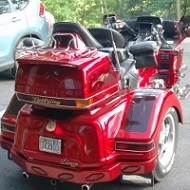 With the 11-1112s, the front of our trike does not sag, and after a stop, will rock back as front forks rebound (but with us on it, rebound stops before forks top out, no clanging noises) and as I ride back roads, they absorb the new pavement over old bumps, bridge ends, small pot holes great. Thank you for a very interesting information. If i understand, it seems that you have some fork tube extensions to make for the lost in ground clearance caused by going to the 6 deg rake tree. Yep, that is their reason for being. They came with the Champion E Z Steer kit. CSC used to send longer fork tubes with their kit as I recall, I think thier's allowed doubling the bushings maybe, but mine have held up just fine with stock lower bushing numbers. Need opinion on installing progressive springs in gl 1500 trike. Does the tight wound end need to go down or up? The springs don't care, but I put mine's closed coils down first so any noise from close coils bottoming against each other is dampened down in oil.